Looking for the best patriotic decorations for Memorial Day, the 4th of July and Labor Day? Make your outdoor parties festive with red, white and blue embellishments. Here is a collection of our favorites. This bunting vertical flag looks beautiful over a porch or hanging from an awning over a deck. It’s a great and easy patriotic decoration for the exterior of your home. And as an added bonus, you can re-use it year after year. It also pairs well with a charming porch swing. If you are planning to throw a patriotic themed party this summer, be sure to take a look at local shops for flag-themed plates and napkins. These make outdoor cleanup very easy, so you can spend less time cleaning and more time enjoying your company. Plus, this gives you more time for other party prep projects! 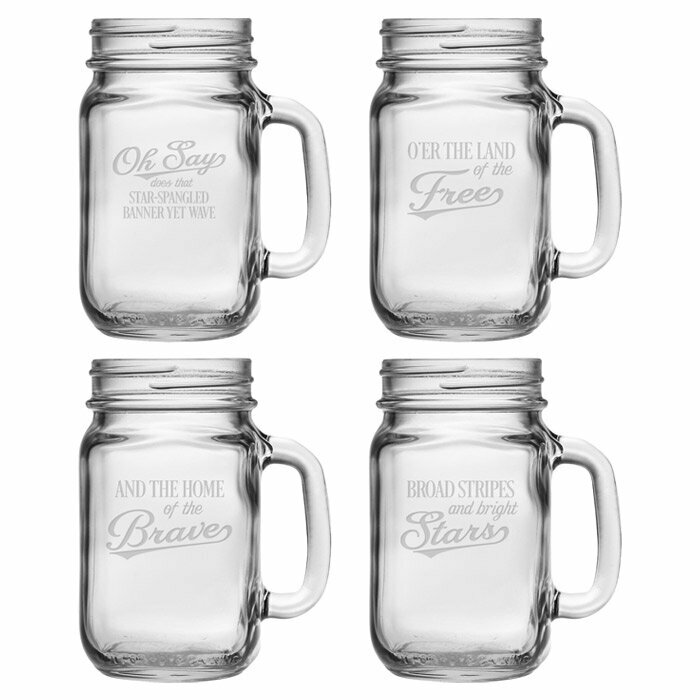 We love these versatile glass mugs emblazoned with lines from The Star Spangled Banner. They’re a unique way to celebrate patriotic holidays, and they are perfect for serving everything from lemonade to cocktails. You may want to keep them around your home bar permanently. Stand this patriotic gentleman up in a corner of your deck, patio or porch, and you are bound to get some compliments! Like the flag bunting, this is décor you can keep using year after year for multiple get-togethers. It goes well with a clean deck! Visit a local party/decorating store to find these fun Uncle Sam hats. It’s a great way to get into the spirit of the holiday and they make a fun addition any photos taken at your party. Check out more ideas for planning backyard parties. Pick up some flag cupcake liners, then add red, white and blue sprinkles. Presto – patriotic cupcakes have never been so easy to make, and they don’t even require food dyes! We’ve also got more Labor Day food ideas to check out. This particular wreath offers a beautiful take on patriotic displays. Hang it near a sitting area or on your front door to help complement the surroundings. You DIYers may want to start with the bare branch wreath and create the patriotic flourishes yourselves. Make it part of a patio makeover. As you can see, inventive wall décor is possible with just a few ribbons, some fake flowers, and a touch of imagination. This is an excellent option if you want to create patriotic décor without spending much – all you will need are hooks or nails to hang them from. This particular flag pillow is made of polyester and faux linen so that it can stand mild outdoor weather. And if you want to make your porch or patio more festive for your party, then a pillow like this is an ideal choice. While you’re at it, you may want to DIY new patio furniture, too. Buy a collection of mini flags when they go on sale for the summer holidays. These flags are reusable. And as you can see, they make a good pairing with burgers or a fun, minimalistic centerpiece. These quick decorations leave more time for making a difference! For all-summer-long patriotic ornamentation, look for carnations or other flowers that are available in red, white and blue. Also, you can make your own potted or vase floral arrangements by picking out individual flowers from your garden or the store. The right flower container helps, too. This wooden flag sign is the ideal choice for a durable outdoor decoration that can last through the seasons and look good anywhere. Ambitious Dyers should note that recycled picket boards make good materials for building and painting your own version! Reclaimed wood projects are always fun. A burlap centerpiece is durable enough for any outdoor use, and offers a more muted patriotic theme for your table. The candle holders are included in this product, but get inventive – they can hold a lot more than just candles! A new table may in order, so check out these 10 DIY tables you can build quickly. This type of tasty table arrangement is very popular right now. And be sure to add a pack of red, white and blue stars around your candy dish for added fun. Kids and sweet tooths alike will especially appreciate this patriotic embellishment. Plus, this quick decoration leaves you more time for important meal prep work. This star-themed table runner can be used indoors or out and at serving or eating locations for a bright patriotic addition. It pairs well with those flag-themed napkins and plates, as well as similar décor! Feel free to design a serving tray to match.